The 2019 PODS call for participants is currently open. In the summer of 2018, Georgetown’s Biology Department found the roots of quantitative aptitude in a potentially surprising place: writing aptitude. That summer, members of the Biology department convened a Productive Open Design Space (PODS) group, led by Teaching Professor Manus Patten, as part of CNDLS’ annual Teaching, Learning & Innovation Summer Institute (TLISI). They aren’t alone in their pursuits; each year multiple groups of faculty and staff apply to form PODS teams to pursue projects that can more easily come together with concentrated time and collective effort. The goal of the Biology faculty in this group was to design a framework for fostering quantitative literacy in biology majors—or, as they called it, Quantitative Reasoning in the Discipline (QuID). PODS and TLISI gave them the space and time to do it. When Biology faculty came together again for TLISI 2018 with an analogous concern—problems with quantitative/mathematical literacy in student theses—the hope was that they could successfully use the same approach to this issue that they did with writing. The first task of the group during the intensive PODS week was clarification: “We spent all morning over coffee and snacks provided by CNDLS deciding this particular thing….It took a couple of days to figure out exactly what QuID looks like.” After some discussion the group outlined four competencies they wanted to foster in their students: Basic Skills of Numeracy, Calculation, and Visualization; Computation; Statistics and Data Analysis; and Modeling and Abstraction. Then, in another step analogous to what they did when tackling writing, they articulated, for each competency, three levels of increasing mastery, with the goal of guiding students through these levels during their time in the major. For example, one skill under the umbrella of the Computation competency involves databases. Students are expected first to be familiar with databases and to practice extracting data from them; next they need to become “an intelligent consumer” of databases; and, finally, they are expected to be able to create their own. 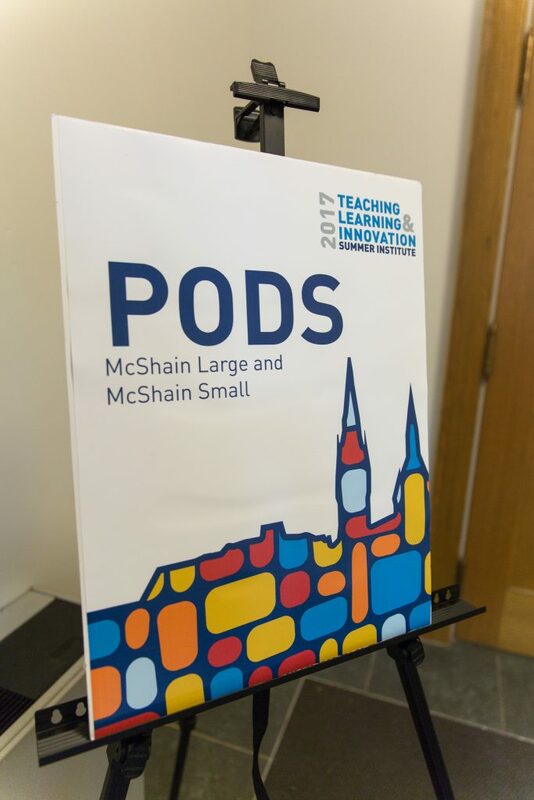 This year’s PODS will take place at TLISI May 20 – 23, 2019. Our applications for PODS are now open, and we invite all faculty and staff at Georgetown to consider applying. For more information, please visit the TLISI website. Posted February 7, 2019 by David Ebenbach & filed under TLISI.